Down Syndrome Connection of NWA. and dreams are as a teenager with Down syndrome. their condition and they wish to be treated just like you. Each of the stars has their own talents, characteristics, strengths and challenges. Down syndrome is just onepart of who they are and this film identifies how to handle and accommodate differenceswhile celebrating the many similarities our friends with Down syndrome have with their peers. Kids are naturally curious and the special needs of peers with Down syndrome can raise a lot of questions. when questions are left unanswered it can lead to fear of the unknown, which may cause peers to lash out, ostracize or judge their classmates with Down syndrome. The film's primary goal is to open hearts and change perspectives because, "when you have the knowledge you understand, and when you understand you can accept that kids with Down syndrome just want to be treated like any other kid, just like you. The DSCNWA encourages you to invite you family, friends, teachers and medical professionals to come meet Rachel. 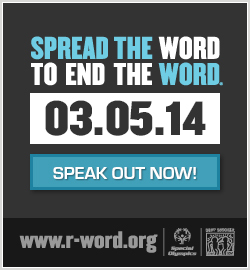 Today is March 5th which means it's Spread the Word to End the Word Day! Spread the Word to End the Word®Fact SheetWHATSpread the Word to End the Word®is an ongoing effort by Special Olympics, Best Buddies and our supporters to raise the consciousness of society about the derogatory use of the R-word and encourage people to pledge to stop using the R-word. The campaign, created by youth, is intended to engage schools,organizations and communities to rally and pledge their support at www.r-word.org and to promote the inclusion and acceptance of people with intellectual and developmental disabilities. The annual day of awareness is held the first Wednesday of every March. While most activities are centered on or near that annual day in March, people everywhere can help spread the word throughout their communities and schools year-round through pledge drives, youth rallies and online activation. Spread the Word to End the Word was founded by college students Soeren Palumbo (Notre Dame 2011) and Tim Shriver (Yale 2011)in 2009, and continues to be led by passionate young people, along with Special Olympics athletes and Best Buddies participants across the United States and in many other parts of the world. Why? Respectful and inclusive language is essential to the movement for the dignity and humanity of people with intellectual disabilities. However, much of society does not recognize the hurtful, dehumanizing and exclusive effects of the R-word. Language affects attitudes. Attitudes impact actions. Make your pledge to choose respectful people-first language today by visiting www.r-word.org to learn how you can Spread the Word to End the Word.